Hello everyone! Two representatives from Europe are currently visiting Peru in the framework of job shadowing activity of our project Women get back. 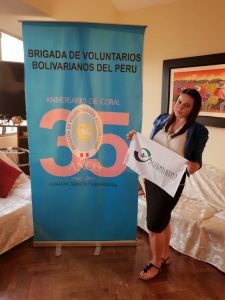 Petya Kulina from Alternativi International Bulgaria and Gabriel Breziou from GEYC Romania will spend more than a week in Lima, Peru in the hosting organization BRIGADA DE VOLUNTARIOS BOLIVARIANOS DEL PERU. The delegates will explore the activities of the hosting organization and get to know the local reality,Variety of activities are part of the program-stay tuned for more info,photos and videos!